TMC's ITEXPO was named one of the fastest growing trade shows by Trade Show Executive in their Fastest 50 Awards. I've been with TMC since 1994 - right out of college and I've seen this company grow from 15 employees to over 65 employees. It's been an amazing ride. TMC's ITEXPO has had some stellar companies participate over the years, including Asterisk, Avaya, Cisco, Microsoft, Packet8, ShoreTel, and Skype. TMC CEO Rich Tehrani said, "Much thanks goes to all of TMC's readers as well as our sponsors, attendees, partners, vendors who supply us decorating services, audio/visual, etc and of course the tireless TMC team who works around the clock to over-deliver for customers. The doors open to ITEXPO West 2010 today! 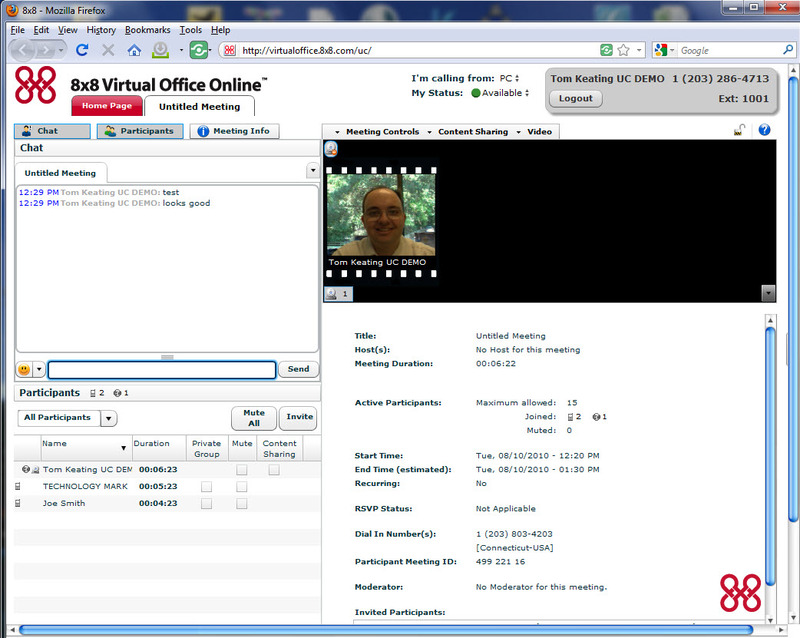 8x8 sent me a trial account of 8x8 Virtual Office Pro to review. What is Virtual Office Pro? Think of it as your web-based communications portal handling phone calls (auto-attendant, VoIP), internet fax, hosted conferencing and hosted application sharing. The only missing piece from the equation is email, however it does support direct integration with Exchange Server by leveraging Outlook Anywhere to pull in your Outlook Contacts. I don't have a lot of information at the moment, but apparently there was a data problem with one of our underlying carriers. According to IBISWorld, VoIP was named "Industry Of The Decade" besting even the search engine industry? Surely, you jest. You mean to tell me the VoIP industry beat Google's, Yahoo's, and MSN's (now Bing's) billions? VoIP even beat online dating. In the ITEXPO Press Room I just met with Cliff Rees, President & CEO of XCast Labs. They have some interesting VoIP technology, including a patent called "direct RTP" which reduces VoIP bandwidth requirements in half. The example Cliff gave was a VoIP call from Los Angeles to San Francisco using Net2Phone based out of New Jersey. When the Los Angeles user calls the San Francisco user, it initiates a 90Kbps IP call cross-country to Net2Phone's headquarters in New Jersey. Today, sipgate is launching a new free VoIP broadband phone service called sipgate one. sipgate one is similar to Vonage, Packet8, and other broadband VoIP providers, but with some additional cool features and a fairly unique pricing plan. For instance, you get a free telephone number, no set-up costs and no monthly charges or minimums. I spoke with sipgate CEO Thilo Salmon to find out more about sipgate one. "We are providing all subscribers who experienced this issue with the following explanation and resolution procedure via email and customer support calls. Let me know if you have any further questions." At 7 pm last night (January 22, 2008) Register.com changed the DNS for www.packet8.net and www.packet8.com by omitting the DNS and substituting a landing page in its place. The net result was call failure and inability to find Packet8 website. Toktumi recently announced a partnership with Dell to distribute its small business VoIP service through a co-branded site on Dell.com (www.dell.com/voip), which also features Fonality, Nortel, and Bandwidth.com. So what's so special about Toktumi, (a word play on 'talk to me') and it's USB-based plug-in device? Well, Toktumi is very similar to the popular Magicjack, which also uses a USB connector for connecting an analog phone. However, Magicjack is only $19.99/year (first year is $39.95) for unlimited U.S.
Keynote Systems released their latest VoIP quality report with some interesting findings. For one, Comcast, a cable company dominated the voice quality rankings beating the closest competitor by nearly 300 points. As for reliability, to no surprise AT&T won this category, no doubt to their decades of experience in building reliable voice and data networks. Keynote Systems measures VoIP quality (MOS scores), call completion, etc. by automatically placing calls from corporate apartments using residential VoIP services and network services just like a typical residential customer would. Service Reliability scores are based on the key performance metrics of Service Availability, Average Answer Time and Number of Dropped Calls.